, an English divine, who deserves to be recorded among the benefactors of mankind, was the son of Alured Clarke, gent, by Ann, the fourth daughter of Charles Trimnell, rector of Abbots Riptou in Hampshire, and a sister of the bishop of Winchester of that name. He was born in 1696; and alter receiving his early education at St. Paul’s school, was admitted pensioner in Corpus Christi college, Cambridge, April 1, 1713, where after taking the degree of A. B. he was made fellow in 1718, and proceeded A.M. two years after. At this | early age he became a candidate with Mr. (afterwards Dr.) Ward, for the professorship of rhetoric in Gresham college, but without success. In May 1723, he was collated to the rectory of Chilbolton in Hampshire, and installed prebendary of Winchester on the 23d of that month. He was appointed one of the chaplains in ordinary to king George I. and continued in the same dignity in the subsequent reign, when George II. 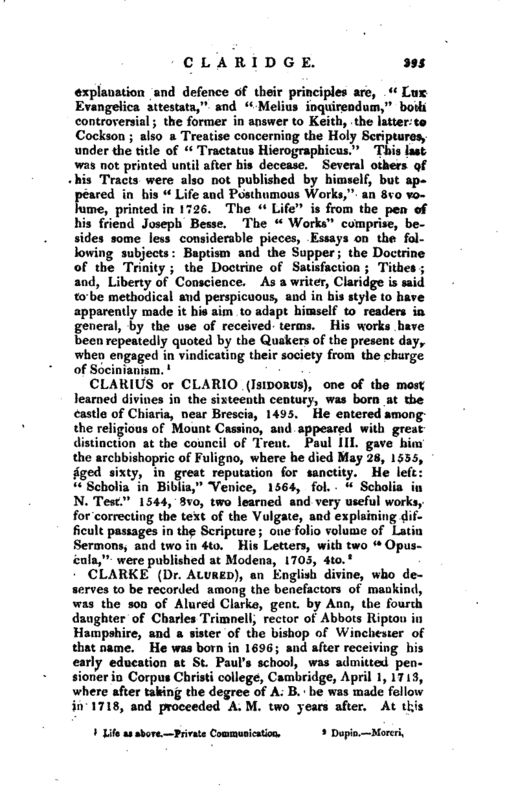 on his visit to Cambridge in April 1728, honoured him with the degree of D. D. and promoted him to a prebend in the church of Westminster, in which he was installed May 8, 1731; being then one of the deputy clerks of the closet. As a farther mark of the royal favouiy his majesty advanced him to the deanery of Exeter May 12, 1740; but he did not enjoy this long, being always of an infirm and weak constitution, which was worn out before he had completed his forty-sixth year. 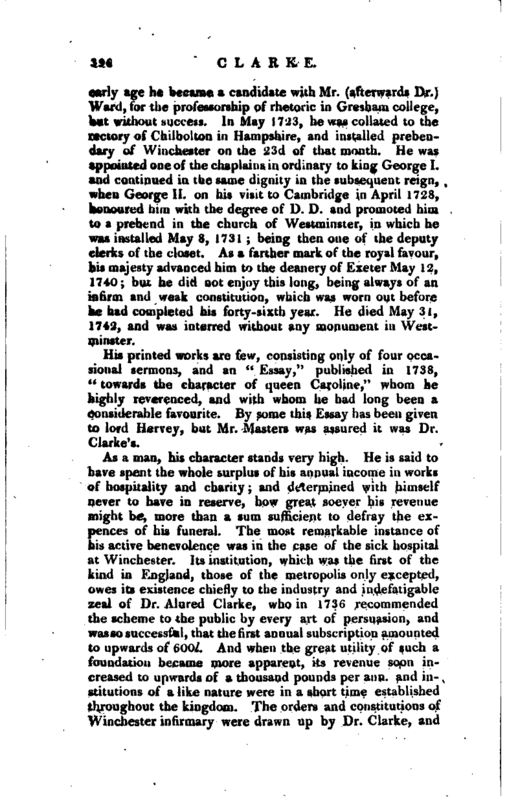 He died May 31, 1742, and was interred without any monument in Westminster. His printed works are few, consisting only of four occasional sermons, and an “Essay,” published in 1738, “towards the character of queen Caroline,” whom he highly reverenced, and with whom he had long been a considerable favourite. 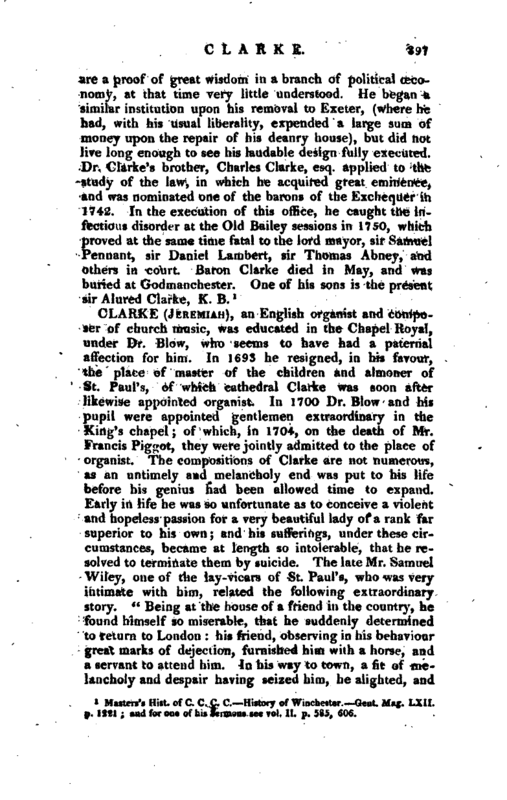 By some this Essay has been given to lord Hervey, but Mr. Masters was assured it was Dr. Clarke’s. 1 Masteis’a Hist, of C. C. C. C. History of Winchester Gent. Maf. LXII. p. 1221 and for one of his Sermons see vol. II. p. 535. 06.